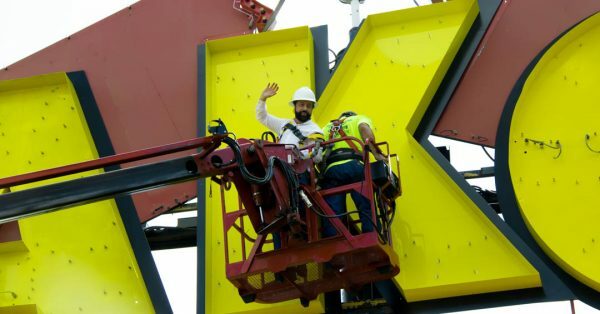 Yakov Smirnoff “supervising” the repair of the “K” on the YAKOV sign during the announcement. After a two-year absence from his Branson theatre, America’s favorite Russian comedian, Yakov Smirnoff, announced on September 20, 2017, that he would be returning to his theatre in 2018. The announcement was made as he was personally “supervising” the repairs to his theatre sign. Yakov was born in Odessa, Ukraine on January 24, 1951 and brought his comedy to America when he immigrated with his family in 1977. Prior to his latest two-year tour, Yakov had spent 20 seasons entertaining Branson audiences making them come alive with laughter. His comparisons with life in Russia and life in America, along with his philosophy and insights about how “Love and Laughter” go hand in hand and is as funny, interesting, and entertaining. Yakov will be continuing his worldwide tour, performing and teaching courses on “Happiness and Laughter,” until he returns to perform in Branson from October 13 through November 24, 2018. He is an accomplished artist, holds a Master’s Degree in Psychology from the University of Pennsylvania, and is currently earning his Ph.D. in Psychology and Global Leadership at Pepperdine University. This entry was posted in Branson Shows, Featured, General on September 28, 2017 by Gary Groman.